Armed with a portfolio of smart and efficient hollowcore solutions and equipment that ensure greater control, predictability and reliability for hollowcore producers, Ultra-Span Technologies says it is on its way to becoming the leading partner in the Middle East region. Through collaborative work with precast producers, Ultra-Span offers increased profitability and success. The Canada-based company offers hollowcore solutions including hollowcore extruders, saws, casting pallets, production service vehicles, lifting clamps and accessories – a range it continues to expand. Among the products it has recently added to its portfolio are the EXT-400Si extrusion system and the SMA-400 360° multi-angle saw, which is capable of handling 100 per cent of hollowcore cuts directly on the casting pallet with unbeatable reliability. According to Kushal Jani, who is responsible for business development at Ultra-Span Technologies, the company’s technology brings high performance gains to precast producers in the region. 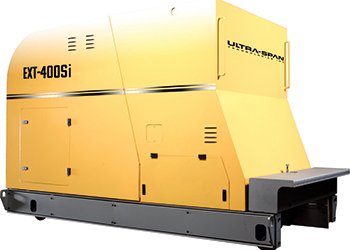 Compared to competitive equipment on the market, he adds, Ultra-Span’s equipment offers unbeatable uptime and low maintenance costs as there are fewer moving parts. Turning to the EXT-400Si, he says the extruder has been designed to handle the Middle East’s unique market conditions and operating cost requirements. It deploys advanced performance via Ultra-Span’s modular adaptive structure, smart-start technology, moisture control and operator online optimiser. The system has recently been installed at National Concrete Company (NCC), a leading producer of precast elements in Bahrain. The company, which is owned by the reputable conglomerate YK Almoayyed Group, wanted a suitable technology partner who could deliver the best solution in equipment uptime, sustainability and throughput for its market needs, with the additional requirement of using the existing plant layout and concrete delivery infrastructure. In addition to the equipment and infrastructure, another very important criterion was that the new solution should reduce the current maintenance and operating cost. After several rounds of technical meetings, efficiency discussions and performance analysis with suppliers from all over Europe, NCC selected Ultra-Span as its technology partner for the hollowcore plant project, says Jani. He attributes Ultra-Span’s success in securing this assignment to its capacity to deliver on the metrics set by NCC and the fact that the company could count on its experience to support the internal team during the installation and efficient operation of the equipment. NCC invested in the EXT-400Si extrusion system that is designed to minimise all cost factors deemed critical to financial success – concrete usage, uptime and ease of maintenance. The EXT-400Si is based on an integrated and sophisticated technology that requires less labour and qualification. “Standards are set at a demand of 0.25 operator, while lights-out, unmanned extrusion can be achieved, allowing the labour quotient of the NCC plant to be used in other tasks, thus raising job profitability,” he adds. Other benefits of the EXT-400Si are its low material consumption while offering longer spans and higher load capacity. “In addition, with Ultra-Span’s patented vibration system, the EXT-400Si requires approximately 80 per cent less moving parts than many other technologies and delivers superior results with only a few parts in contact with concrete – which means lower maintenance costs. The EXT-400Si is so streamlined for ease of maintenance – it is completely free of grease lines and belts, resulting in lower operating costs,” says Alfonso, lead engineer. Ultra-Span’s service department has more than 50 years of experience at the disposal of precast producers, in addition to the resources for onsite support; its goal is to keep all equipment producing on time and on budget, without interruptions. “We are truly honoured by the NCC decision and their vote of confidence in our people and technology,” says Alain Valdes, CEO and president of Ultra-Span. The EXT-400Si’s performance is delivered in a harmonised manner for high-quality, high-performance demands. Following a collaborative review of the hollowcore producers’ requirements, Ultra-Span fine-tunes the EXT-400Si extrusion system to suit the production standards, market requirements and critical success factors for their region. Other clients in the region who are deriving benefits from the Ultra-Span system are the Al Khobar-based Industrial Contractors Company (Inco) and Precast Building Systems in Saudi Arabia; and Mega Prefab and PPB Structures in Lebanon. Ultra-Span’s local distributor and parts supplier is Webau Middle East based in Jebel Ali, UAE. Commenting on business, Jani says the past year has been busy for the company, which has been witnessing an increase in market share and a higher demand for its products. According to Jani, precast producers are becoming more discerning and focusing on getting a quality service and support – which Ultra-Span is committed to providing. To maintain and further increase its market share, the company has expanded its engineering and support team, and aims at remaining competitive in terms of pricing while offering higher value-added services to producers. It is also investing in research and development (R&D) to deliver superior technology that increases the profit and performance of precast concrete products for its clients.